A malfunctioning refrigerator isn't necessarily ready for the trash. You may not know it, but there are a number of DIY fixes you can try to troubleshoot a troublesome fridge. Read on for 5 homeowner-friendly solutions to this appliance's most common woes. Holiday entertaining is getting underway, and gracious hosts everywhere are busy cleaning, shopping, decorating, crafting, and cooking up all sorts of incredible edibles for family and friends. With all that planning and hard work going into creating delicious dishes for guests, the last thing you need is a fridge on the fritz. Fortunately, most common fridge ailments are easily treatable by the handy homeowner. Armed with just a little bit of know-how and some readily available parts, you can deal with many maladies before they become dining disasters. Here are a few typical problems and some DIY solutions that can help keep your hardworking refrigerator in tip-top shape. 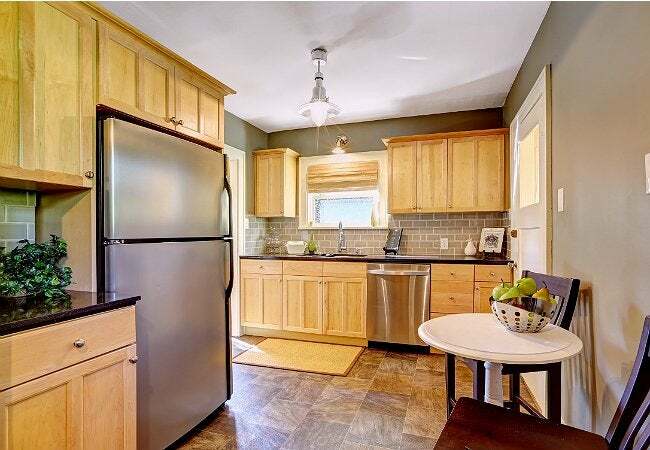 PROBLEM: You’ve found a puddle of water on the floor in front of or under the fridge. SOLUTION: Tighten and replace any faulty tubing. Start by identifying the source of your leak. 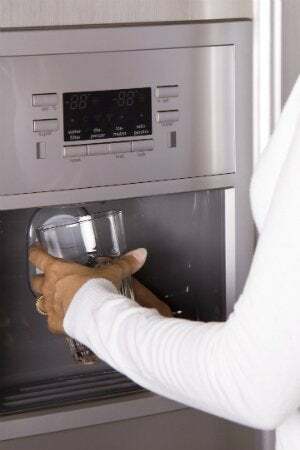 The most common troublemaker, and the first place to check, would be the water supply to the refrigerator’s ice maker and/or water dispenser. Look for the water supply shut-off valve, either in the basement or under the sink closest to the refrigerator. Once the water has been shut off, replace any cracked, worn, or brittle tubing according to the instructions that come with the part. Alternatively, you may need to replace the water inlet valve, which is a solenoid-operated device that connects your household water supply line to your refrigerator. This valve can typically be found at the rear of the fridge, near the bottom. First, carefully inspect its supply connections for leaks, then tighten or replace the connectors; while you’re back there, check the valve body for any cracks and replace if necessary. PROBLEM: Noise, noise, noise! Your fridge is making grinding and scraping sounds. SOLUTION: Check and clean out your appliance’s fan motors, located at the condenser and evaporator. Most modern frost-free refrigerators operate with a fan-cooled condenser coil, which is located near the compressor, at the bottom rear of the refrigerator. To investigate whether or not it’s functioning properly, first disconnect all power to the fridge and remove the rear access panel. Look for any obstructions or debris that could be preventing the fan from moving freely. If any fan blades are physically damaged, or if the motor shows visible wear, these components will need to be replaced. Also, check the rubber mounting grommets for signs of wear, and replace if necessary. If the noise seems to be coming from the freezer, however, the evaporator fan motor may be the one to blame. Located in the freezer compartment, this motor pulls air over the evaporator coils when the compressor is running. Again, disconnect all power to the fridge and remove the evaporator fan cover from the freezer. As with the condenser fan, if any of the fan blades are loose or damaged, or if the motor shaft doesn’t turn freely, these parts will need to be replaced. Also, check the evaporator fan motor grommet, which isolates the motor from the mounting bracket; regular wear and tear can cause the grommet to detach, leading to increased vibration and noise. 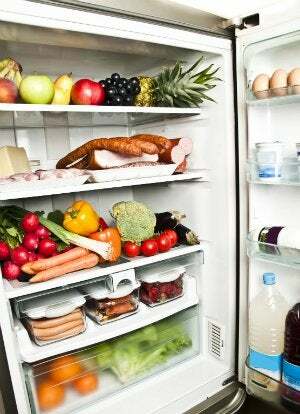 PROBLEM: The fridge cycles on and off more frequently—or, worse, it won’t start at all anymore. SOLUTION: Dust out your fridge’s coils. Frequent cycling often indicates dirty condenser coils and dirty fan blades. Especially if you share a house with animals, dust, debris, and fur can accumulate along the condenser fan blades and on the coils. In extreme cases, this condition will trip an overload relay and prevent the fridge from turning on at all. But the fix is an easy one: Turn off the power to the unit, and remove the rear access panel. Carefully vacuum the coils, fan blades, and motor with the brush attachment of your vacuum. To help prevent future dust buildup, cut a section of lightweight filter material—or, in a pinch, stretch a piece of old pantyhose—and fit it inside the vent panel beneath the door to trap debris before it reaches the coils. PROBLEM: You’re constructing a mini glacier inside your freezer. SOLUTION: Seal up any gaps. Ice and moisture buildup inside the freezer or refrigerator compartment typically results from damaged door gaskets or torn seals. A leaking gasket or seal will allow cold air to constantly seep out of the unit and allow excess moisture inside the unit, creating a layer of frost—one that eventually turns into an ice dam. To see if you have a leak on your hands, stick a high-powered flashlight inside the freezer with the beam pointed at the door and shut it inside. Kill the lights in the kitchen. If you see any light leaking around the door, replace the defective gasket. Clean the gaskets regularly to help keep them pliable and working properly. If you can’t find any problems with the gaskets, check the door hinges next. If the hinges become worn out or the lubricating grease dries out, the doors may not close completely, allowing moist room air to seep into the fridge. A common indicator of a faulty hinge is a thumping or scraping noise when the door is opened or closed. Lubricate stiff hinges with food-safe grease, and replace any worn or damaged hinges altogether. PROBLEM: Your ice maker just doesn’t work. SOLUTION: Flip the functionality back into gear. Yes! It can be that simple. Check to see if the wire along the side of the ice maker assembly is raised, which indicates the unit is turned off. Typically there is a red lever that lowers the wire into the “on” position. (If there is no lever, gently pull down on the wire itself to turn the unit on.) Another problem may be a blockage or leak in the water supply system. Inspect the fill tube and the fill cup area at the back of the ice maker to make sure nothing is blocking the water supply—sometimes a buildup of ice (caused by faulty door gaskets) can block the fill tube; you can defrost it using a hair dryer. You should also inspect the inlet valve and water supply tubing for leaks or damage. Finally, check to see if your ice maker is equipped with a filter. Many newer models include a carbon filter that helps remove debris or contaminants from the local water supply. Over time, the filter can become clogged, thereby reducing the water flow to the ice maker. Most manufacturers recommend checking and replacing the filter every six months, or more frequently if necessary. PROBLEM: You found a spill inside your refrigerator, but nothing seems to have leaked. SOLUTION: Clean and clear out the drain tube. Many fridges have a drain tube that routes excess moisture to a drain pan underneath the fridge; there, the evaporator fan then blows over it to disperse the moisture. If the drain tube becomes blocked by food spills or other debris, that moisture could end up on the inside of your fridge rather than where it’s supposed to go. Turn off the power to the refrigerator and look for the drain plug, which should be located near the back or bottom of the main fridge compartment. Next, use a turkey baster to force a 50/50 solution of bleach and warm water (or, if you prefer, white vinegar and warm water) into the drain tube. Repeat this process several times, and then remove and clean the drain pan. …or the unit is leaking and you can’t locate the source of the leak.